1.1. 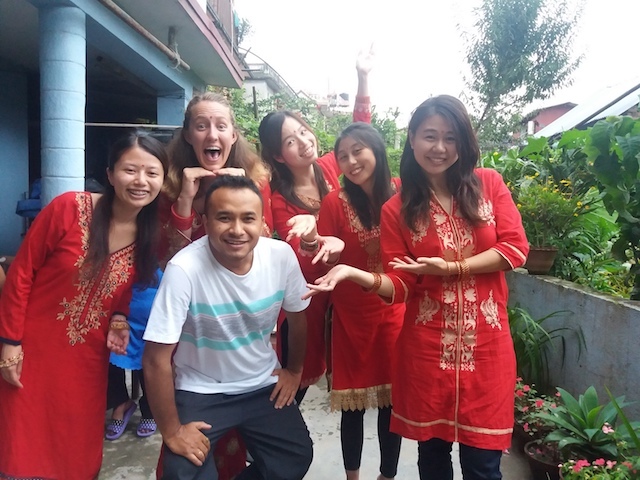 – Why did you choose to volunteer in Nepal Kathmandu, what program(s) are you doing and why? Why Nepal: I choose Nepal because I’ve never been to this country and I know that it is very different to my home town. I wanted to learn more about their historical monuments and the way they practice Dentistry. What program: Volunteering at a Dental Hospital in Kathmandu. 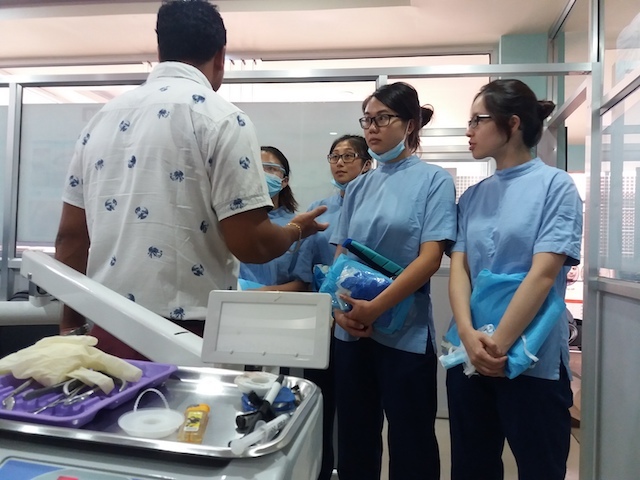 Why this program: As a Dental student I would like to learn more about how Dentistry is practiced in Nepal and whether there are any similarities and differences. Also I wanted to compare public awareness of local people with patients back in Hong Kong and weather the problems they face are similar or not. Moreover I wanted to expand my knowledge from the local Dentists and help treat people in need. Volunteer Program: I found that the most surprising thing is that the way of practice in terms of technique and materials used were rather similar to Hong Kong. Also I was surprised by how friendly the Doctors and staff were and they were eager to get to know us and exchange knowledge as much as we were eager to know them. Host Family: One of the most surprising things was how generous and selfless our host family was. They would always be there for advice when we needed them and even invited us to participate in their festivals with their family. Although I was miles away from home I felt familiarity and love that this family gave me like I was one of their own. Country: Definitely the people I did not expect so many people in Nepal to be so friendly. In Hong Kong, it is uncommon to talk to strangers and we held our guards up. However we found to realize that these local strangers would go out of their way to help us and translate for us. I was also surprised at how festive the people were and how much effort they would pay into their preparation and we were captivated by their unique traditions. Volunteer Program: As we came during a festival season. The number of patients who came was much less than expected. So we did not have much practical work to do. But again we get to do some independent treatments. Host Family: In terms of host family, ABV provided us with a comprehensive guide and we were prepared. I was actually impressed with the facilities here. Country: The most difficult things we encountered were traffic and pollution. After the big earthquake in 2015 many of the roads were left with bumps and cracks which made the ride rather slow and sometimes uncomfortable. I was also surprised at seeing how many people they can fit into a local micro van as there were people bending over another to get on. However, these difficulties soon became rather endearing and we too found ourselves enjoying our daily transportation. The air pollution in Kathmandu is also quite bad so I would definitely wear a mask when the windows are down. Clothing: As we came in summer, I recommend wearing short sleeve t-shirts and a pair of long, loose trousers. If you would like to purchase local wear there’re many shops where you can do so at an affordable price. Sightseeing: You should definitely take the Domestic flight to see Mount Everest. It is a breath taking view and it was worth every second of the flight. It was truly one of the most beautiful sights I’ve ever seen. Donations: Make sure you donate to credible organizations because there’re many people who try to scam you on the streets. You can even bring resources to donate to government hospitals as they do lack certain necessities e.g. gloves, masks etc. Although we did not visit any orphanages during our short stay, you can bring toys and books to donate to them and leave them at the home stay for someone to collect. Laundry/internet: We mainly hand washed our clothes and the breeze in Nepal means that they dry quickly. The internet at the homestay was fast and consistent, but if you’re worried Sudhir can bring you to buy a phone card with a data plan. a.- City/town: Be careful of your personal belongings, especially money because 1000 rupees may not be worth much to you, but it is a lot to some local people. Although it is quite rare to have your things stolen, try not to flash your valuable around. b.- Weather: The weather is good here most of the time, but roads can get quite muddy after rain. So bring some waterproof and less easily tainted shoes. c.- Local People: Bring a torch if you plan to walk out at night as there’re not many streetlights. Also we’ve found that you can bargain for better currency exchange rates, so bring bigger bank notes as they can give you good rates, if you have USD 100 or 50.
d.- Tours: If you’re unsure where to go spend your weekend, you can always ask the host for advice. It’s advisable to rent a car for the days as saves you the time of bargaining and find transportation. The trip to Kathmandu is one to remember. Throughout these 2 weeks, I have not only grown as a dental student, but as a person. The people we have met here have greatly impacted my experience and I find myself enjoying the stay more and more each day. Perhaps we were not able to do much volunteer work because we stayed for short time , but we gained a lot of insight into the local practices here and We were able to do an extraction case, a minor oral surgery, some scaling and impression, which were enjoyable experiences. We even got to observe an enucleation of cyst, which never seen before. I found myself looking forward to seeing different procedures and talking to the staff every day. I have never felt such compassion in a community and it is very different to our urban cit life, but I find their laid back way of life refreshing change. For sure, I would like to be back in Nepal in a few years time and I’m looking forward to seeing their reconstruction and development. 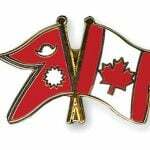 I wish Nepal and its wonderful people all the best. Volunteers can also join the Nepalese language immersion course if they would like to communicate better with the patients. Accommodation: Much better than expected! Everything is clean and the rooms are spacious. The toilet is also much cleaner than any ones you can find outside. If there’s anything you need, the host family will try their best to assist you. Meals (favorite): Chicken butter masala, JU JU Dhau from Bhaktapur & Mutton sha hl karma were amongst my favorites. The home stay also offers western style breakfast in case you’re feeling a little homesick! Security: I had not felt any sense of danger during my stay here. Especially in the home stay, we didn’t even feel the need to lock away our personal belongings. Although, as mentioned before, try not to flash your valuable around too often in public. Host family: The best I can ask for! Sudhir and Sarita were always so welcoming and treated us with kindness. They would cook delicious meals for us every day and let us eat before they did. They would always make sure we are safe and we know how to get around the city. Their toddler is also very, very cute! Program: The thing that I would remember most about the program are the Local Dentists and staff who are amazingly friendly. They not only share their own experiences with us, they would also ask about our own practices. We could see their dedication to their profession and we admire their work ethics. The staffs were also very nice and frequently bought us local food to try. Without these generous and kind hearted people, the experience would’ve certainly been very different. I’m thankful for all the fantastic people I’ve met and I hope to keep in contact with them and allow us to show them our country and return the favor. Host Family: My favourite memory was celebrating Teej (Girl’s Festival) with the family. They took us out to shop for nice dresses and gave us beautiful bangles and taught us their traditional dances. By the end of the night, we were exhausted as we danced the night away. I can feel just how close their families are here and how much they value tradition. This experience was a highlight of my trip and I felt as if I was one of them and I had so much fun. 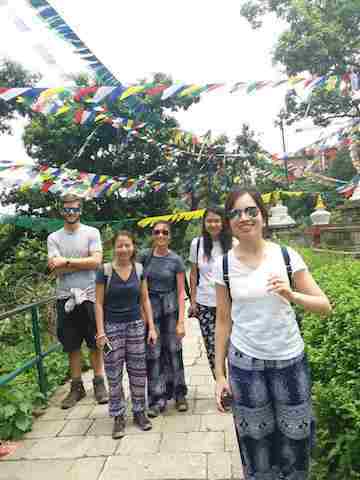 Country: My favourite memory was seeing Mount Everest on the flight, and also integrating into the local community. As we approach the end of our stay, I look back at all the first time experiences I have had here. After 2 weeks, we’ve slowly changed ourselves and our expectations and we find our difficulties & turn into everyday normal life. I never thought I would be used to the culture here, but I can truly say I will miss this place when I return home. There’s so much I can write about but I can tell you that it won’t be the same from you experiencing if yourself. Airport: Sudhir was already waiting for us right at the entrance and recognized us before we even stepped out of the exit. Although we arrived late at night, he was very prepared and helped us organize transportation back to his home. Orientation day: Our orientation day was an unforgettable one. We experienced public transport for the first time and we visited many local temples and main tourist attractions. We got to familiarize ourselves with the city, other volunteers and the hosts. Daily Support: Sudhir would check up on us every day to make sure we’re fine. We also experienced some difficulties when we went out and needed some advice and transportation and the host family is always just a phone call away. traveling? (Emails, website, support) was there anything missing or should be included to prepare other volunteers? Very detailed and sufficient. They also respond to any enquiries very quickly.